"We enter into a commitment by faith, hope and love that we will move together in the will of God to accomplish our shared goals for his kingdom.We determine to share our resources with one another in order to invest in each other for the goal of making disciples both in the greater ____________ area and in ____________.We believe that God has connected us to each other for the purpose of this partnership. We prayerfully depend on the Holy Spirit to use us as witnesses of Jesus Christ in the world." 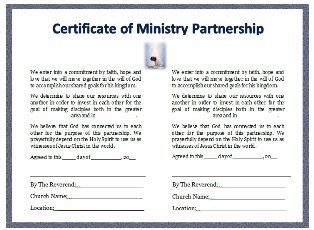 Click Here to download and print the Certificate of License for Ministers. Click Here to download and print the Certificate of Ordination for Ministers. These certificates can be printed on white, cream-colored or any other color of resume, stock or plain paper, and can be inserted into a beautiful picture frame to make this gift even more special. They can also be placed into sheet protectors (purchase from any office supplies store and event WalMart) to keep them looking professional and new if you don't put them in frames. Return to Certificates Page from Ministry Certificates (Partnership...).